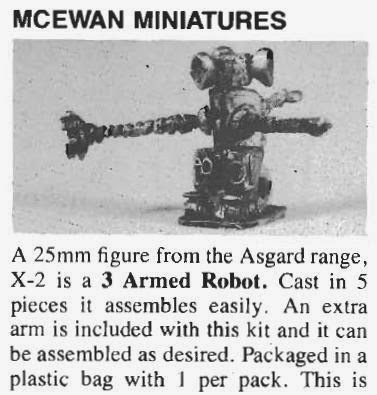 Can't remember where I scanned this advert from but McEwan miniatures imported Asgard into the States back in the day.....haven't seen this mini advertised in the UK before......my example is pictured on an earlier post....(minus the top piece) here. Somewhere I have some more but they are well hidden so I have no idea if I have all of the top bit......grrrrrrrr. Apparently this is a conversion of a Cyborg sculpted by Stan Pochron who came over from the States working with Bryan Ansell all those years ago. More info if I find any! top find Mister, you got a date on this advert? Just posted an edit to it; September '78.